How old is this street sign? After visiting the excellent Georgian Group today (special £15 membership discount for London Historians members), I took this picture of what struck me as being quite an old street sign. All to do with the “W” without a qualifying number. So how old is it? 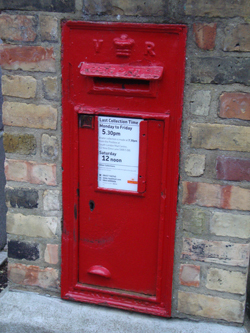 With the massive increase in postage during the early Victorian era, postal districts were introduced to London during 1857 and fully implemented by 1 January 1858. When further qualification was needed, the numbers with which we are familiar were added in 1917. So there we have it. Not exactly precise, but our sign dates from sometime between 1857 to 1917. 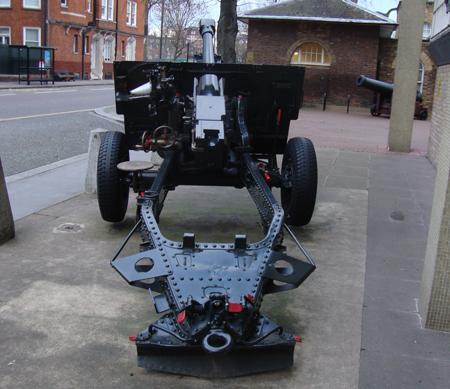 The extra bits after the district code that we use for computerised sorting were implemented gradually during the 1960s up until 1974. 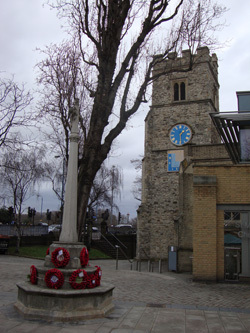 The furthest North London postal district is E4, Chingford; furthest East is SE2, Abbey Wood; furthest South is SE25, South Norwood; and furthest West is W7, Hanwell. Much work on early post codes was done by the author Anthony Trollope, who worked for the Royal Mail. 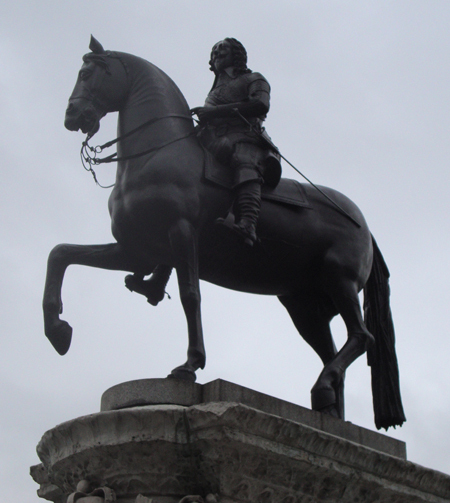 He was also instrumental in introducing post boxes. Not enemy action, rather home-grown explosion. 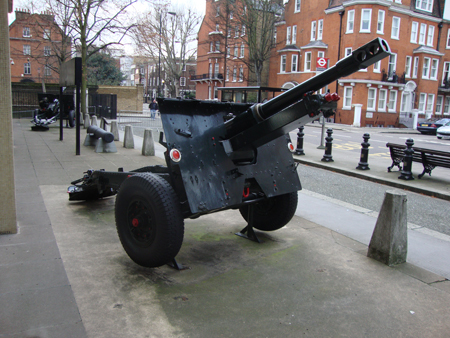 Picture: Borough of Newham. Today marks the anniversary of a TNT explosion which claimed 73 lives and injured a further 400. At 6:52 pm on 19 January 1917 in a Silvertown factory, 50 tons of TNT ignited in a massive blast which completely destroyed the premises, caused widespread damage to the surrounding area, and could be heard throughout most of London. 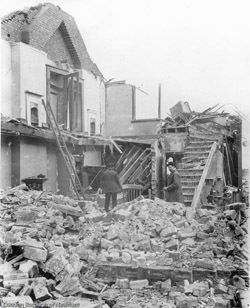 It wasn’t the biggest or the worst industrial explosion in Britain during World War I, but it became the most notorious. 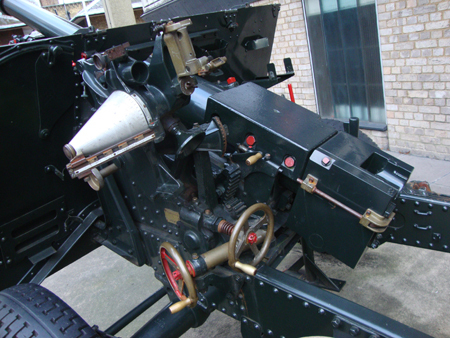 From early in the conflict, Britain found herself critically short of munitions. So the War Office decided to expand the capacity of the Brunner Mond (later known as ICI) factory in West Ham, against the advice of Brunner Mond themselves, on safety grounds. On the fateful evening a fire broke out in the melt-pot room, precipitating the fatal blast. An estimated 70,000 properties were damaged, including a gasometer which released an enormous fireball into the sky. While no actual cause of the accident was identified, enemy involvement was ruled out. To this day, the site of the Silvertown factory remains derelict. Sources: This incident is well-documented on the web. Here is a partial list of links. Yesterday a reader from Trinidad sent me some photos of artifacts recently found on her estate. 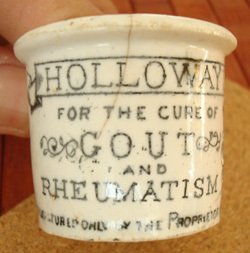 They included a 1903 ceramic gout remedy container by “Holloways” of London. As a graduate of Royal Holloway College, I immediately realised there must be a connection to the college’s founder, Victorian snake oil entrepreneur Thomas Holloway (1800 – 83) . 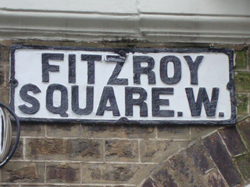 Originally hailing from Devonport, Holloway started late as a businessman, in the 1830s. 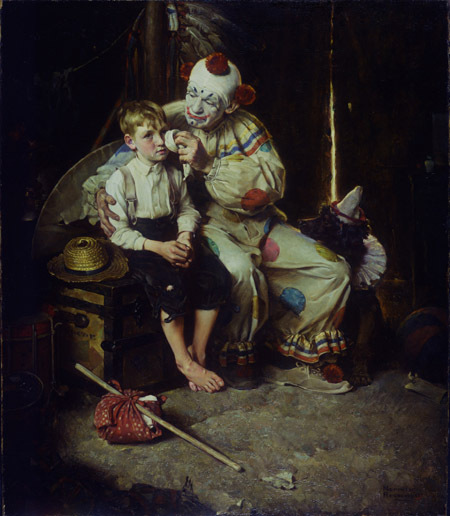 His early attempts to hawk patent remedies were spectacularly unsuccessful, putting him in a debtor’s prison. This was largely as a result of a debilitating feud with his erstwhile partner, the Italian Felix Albinolo, who had introduced Holloway to the lotions and potions business. On release, he dusted himself down and started again, concentrating on digestive pills from his premises in the Strand. Holloway’s success from this time on was based on newspaper advertising, in which he invested huge amounts. Spending typically £5,000 in the early days on an already decent turnover of £20,000, by his death in 1883 his company was shelling out £50,000 per annum on advertising globally, according to Holloway himself. the business also developed a thriving export market to the colonies, although he was less successful in the USA where one suspects that local snake oil operators provided stiff competition. When his premises in the Strand were demolished to make space for the new law courts, Holloway moved his operation to New Oxford Street in 1867, now employing over 100 staff. After his death in 1883, the company continued until 1930, when its viable products were taken over by the Beecham company. Holloway was also a canny investor. It was his policy immediately to sink his company’s profits into loans, acting effectively as a pseudo-bank. He was not known as a sympathetic creditor. 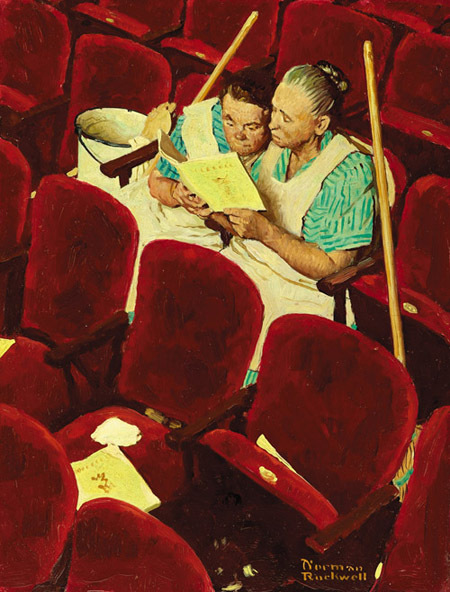 Holloway and his wife Jane had no children, and towards the end of his life his thoughts turned to his legacy. 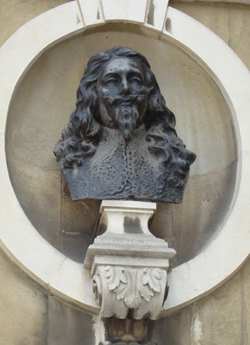 On the advice of his friend the seventh Earl of Shaftsbury (of Piccadilly Circus fame), he first endowed a mental hospital in Virginia Water, not far from his home, at a cost of £300,000. 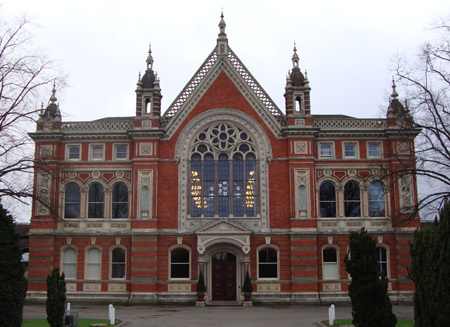 In memory of his late wife, Holloway decided to endow a college for women which became the huge ornate brick edifice in Egham known as Royal Holloway College, by dint of having been opened by Queen Victoria. Both of these institutions opened their doors shortly after the death of their benefactor. Source: Oxford Dictionary of National Biography, entry by T.A.B. Corley.